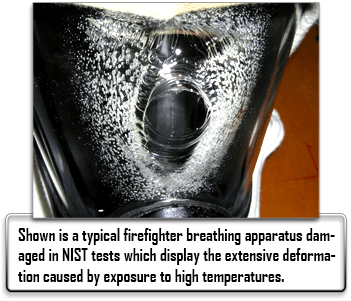 In controlled experiments, (2) NIST researchers determined that an incident radiant heat flux of 15 kW/m2 would be a representative test criterion for determining the performance of SCBA facepiece lenses. It is representative of the flux experienced by firefighters approaching the onset of the deadly phenomenon known as flashover, a state of total surface involvement in a fire of combustible material within an enclosure. Also, the researchers found that measuring internal facepiece pressure was indicative of when holes formed and the effect of holes on firefighter air-supply duration and breathing protection. 2. See the 2012 NIST Tech Beat story "NIST Study of Hazard to Firefighters Leads to Safety Alert" at www.nist.gov/public_affairs/tech-beat/tb20120725.cfm#nfpa. The technical report, Thermal Performance of Self-Contained Breathing Apparatus Facepiece Lenses Exposed to Radiant Heat Flux (NIST Technical Note 1785), Feb. 2013, by A. Putorti, Jr.; A. Mensch; N. Bryner and G. Braga, is available at: www.nist.gov/manuscript-publication-search.cfm?pub_id=912504.